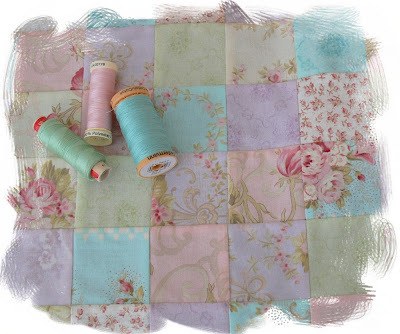 It's time to give you the next block of the free Block of the Month "Thoughts in Thread" quilt. Block 6 reminds us of another area to focus our thoughts - thinking the best, not the worst. I guess that applies in all sorts of situations such as circumstances beyond our control ... and interacting with people - especially those who are different to us!!! 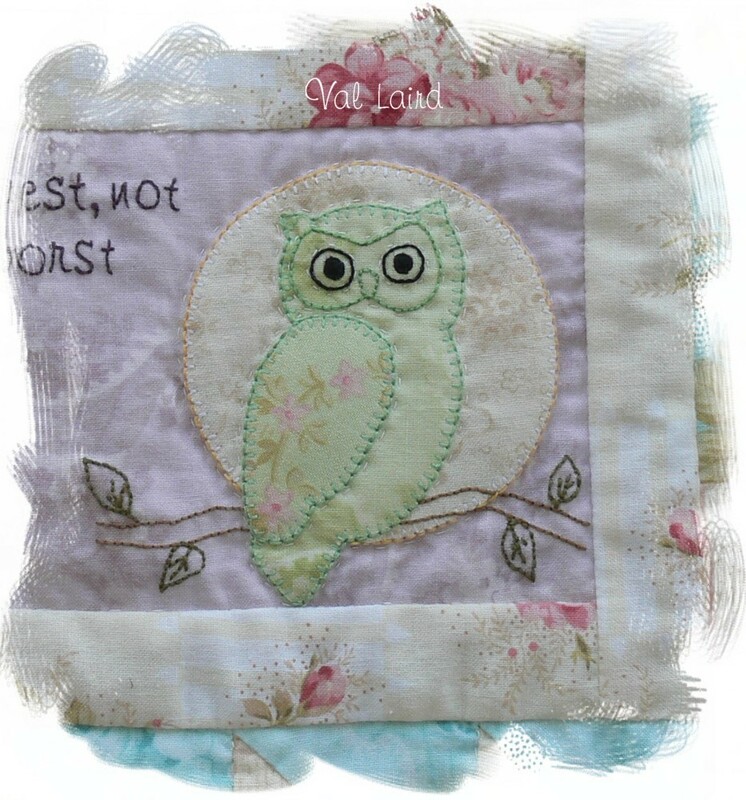 I've done my outlining trick on both the owl and the moon to make them stand out, working a backstitch along the edge of the blanket stitch. I'm really hooked on this effect! 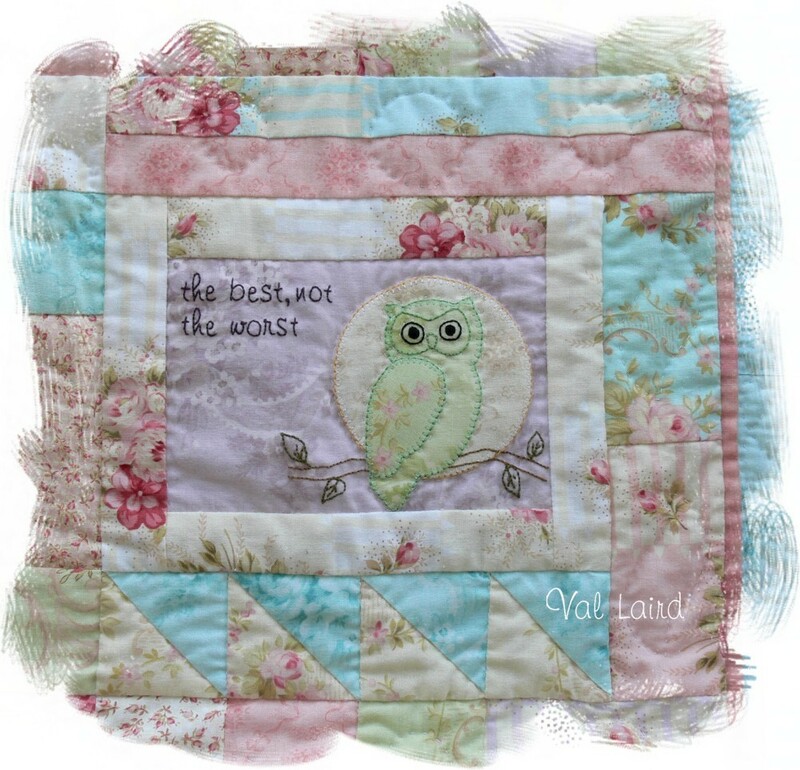 It means you can highlight the edge with a contrast or darker thread, without having a heavy blanket stitch on the actual applique. The new block, along with the previous five which are still available, can be downloaded from my website. 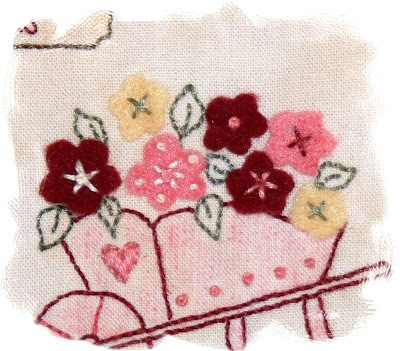 Go here and while you're there, you're invited to have a look at some of my wall-hangings as you scroll down to the bottom of the page! 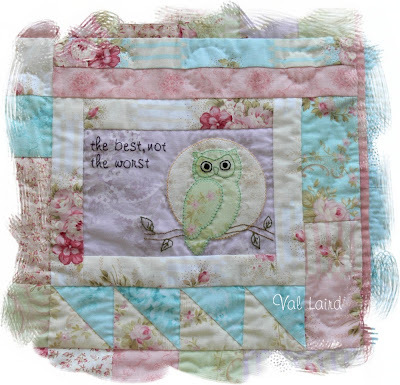 Don't forget to upload photos of your finished blocks onto my Flickr site. There's a button on my sidebar, or click here. (Click "More photos" to see them all.) There's some lovely colour blocks on there now. Some weeks in life are tough - and the weather didn't help last week. It was windy, cold, wet, bleak and miserable. We didn't get to go for our morning walk at all, which only added to the melancholy. But yesterday we were back to a proper perfect Queensland winter's day - clear sky, sunny, peeling off the jumpers in the sun. It was too good a day to be indoors, so we went off straight after breakfast to enjoy the sun and do some birdspotting. To see some birds that we haven't seen for a while was refreshing to the soul after the distresses of the week. 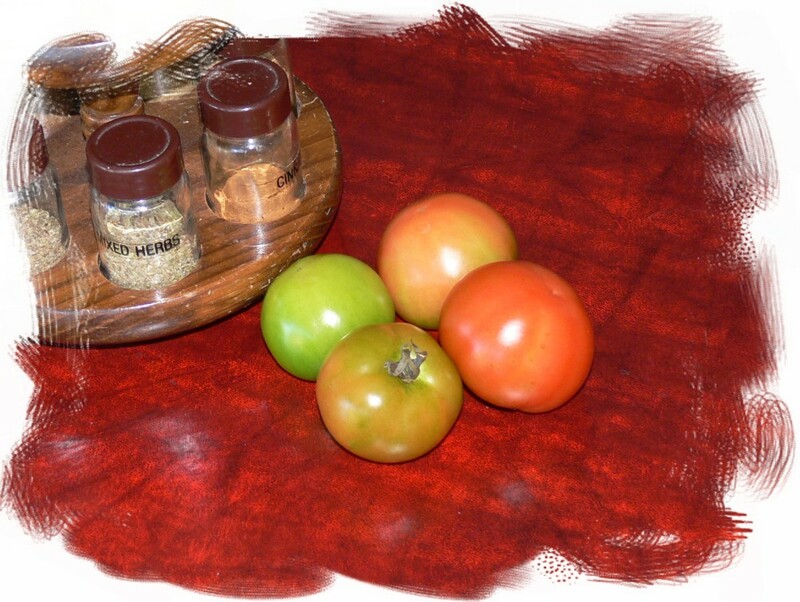 I even got enthused to do a bit of tidyng up in the garden and found some tomatoes were ready for picking. A couple of months ago I discovered two tomato seedlings had happened to find their way out through the air-holes in the compost bin. I decided to let them grow there to see whether they would actually produce fruit in the middle of winter. It's a tribute to our wonderful mild weather that they have succeeded. And it shows what good compost I've been making!!! 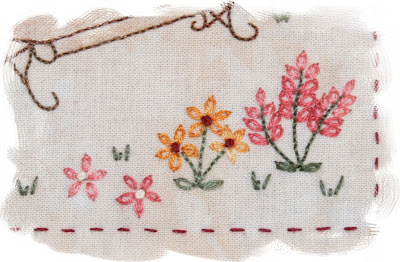 I finally finished the stitching on a commissioned project - it was one of those designs that had far too many "starts", but I think I am happy with it now. I'll wait and see how it turns out when it's all put together for a final verdict! Then in the middle of the week I was sidetracked into starting yet another project. It was one of those designs that couldn't be contained in my mind and had to get out onto fabric straight away. I love it when that happens - you know before you start that it is going to be a winner! 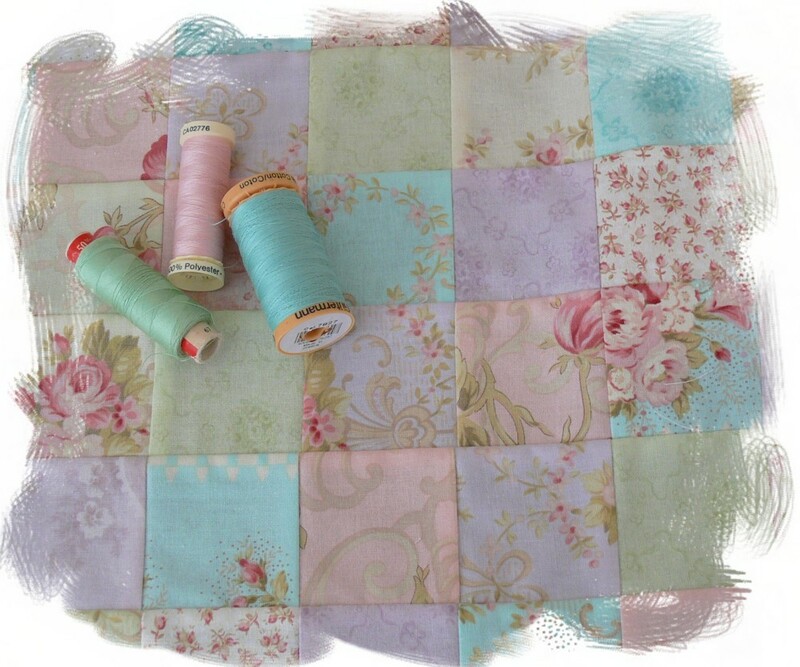 I'm using the same lovely Robyn Pandolph fabric as the Thoughts in Thread quilt. I just love your little owl Val. It's so cute with the moon behind it. Sweet block, Val. Thanks so much. Glad I checked blogs today. I'd missed block 5. Oh yummy! Your little owl is just adorable and I can't wait to have one of my own :*) Thanks again for sharing these sweet designs with us! I love the latest block Val. Then again, they are all so lovely, it's just that I love owls. Your stitchery project is sweet and the current new project has me intrigued. You have been very busy. Take care. Cute stuff you've been designing, again! And I love hearing about the errant tomato seeds that have given you some unexpected goodness. As a composter myself, having a healthy compost heap makes one feel sort of wholesome, doesn't it? Hope those tomatoes were good eatin'!